With hundreds of flowers to choose from to create your personal style and a vast array of rental choices for your arrangements, Folls Flowers has countless options to make your big day perfect. We also offer three levels of service to cater to every floral wedding budget. Folls Flowers specializes in full service wedding flowers. 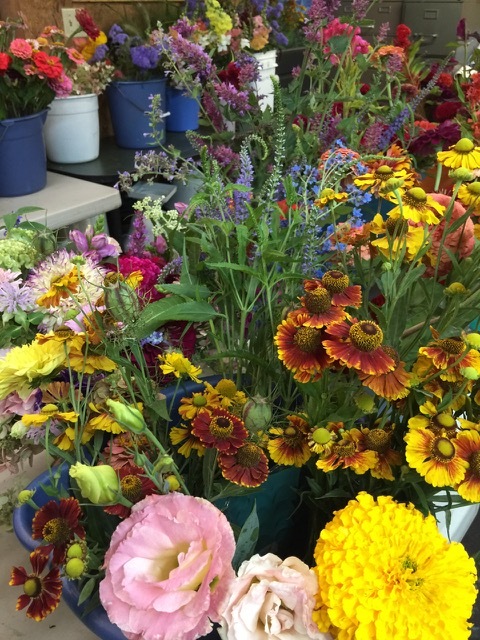 We offer everything a traditional florist does, but with a fresh, unique botanical texture that you can only get from a huge garden with hundreds of different flowers to choose from. Entrusting us with providing only the best floral arrangements for your big day includes a walk through the fields a week before your wedding so you can pick exactly the flowers you wish to see in your arrangements. We can even custom grow flowers for your wedding celebration if it is booked a year in advance. Perfect for more intimate weddings when you may prefer to do your own centerpieces, this option allows you to order the personal flowers you need. From just a bridal bouquet, to an entire bridal party and family flowers. Pick up at the farm or local delivery with a fee is available. We offer a do it yourself option that includes a 2 gallon bucket full of gorgeous blooms of all sizes, and greenery including filler, herbs, and grasses. Each bucket will contain ten bunches of ten stems. Pick up is available at our farm. Availability is limited.